The UK's largest ski tour operator is offering Garmisch Partenkirchen in the Bavarian Alps. So, what's it like? It is Germany's largest ski area with 49kms of slopes in the main ski area and a further 20kms on the Zugspitz glacier - it's the country's highest mountain at 2,962m. The skiing goes from 720m up to 2,830m. It sits close to the border with Austria. "The skiing is spread across a two main areas: the Alpspitze peak and the lower Hausberg and Kreuzeck peaks linked by a narrow track; higher up is the Zugspitz glacier, accessed via a cogwheel railway from town," said Crystal Ski. "There's a fairly even mix of beginner, intermediate and advanced runs, but since the reds tend to be the longest and best links, intermediates in particular will enjoy the area.". "Beginners can stick to the dedicated beginner area, or progress to the wide blues on the glacier. " "Experts will find several tricky blacks to challenge them - including the famous Kandahar run, which is used for annual races and has a free fall section with a 92% incline." Crystal Ski is part of the TUI group, the largest travel business in the world that owns travel agencies, hotels, airlines, cruise ships and retail stores. TUI is a German company with its HQ in Hannover so it seems appropriate that Crystal Ski is offfering skiing in the country. The towns of Partenkirchen and Garmisch have separate identities. 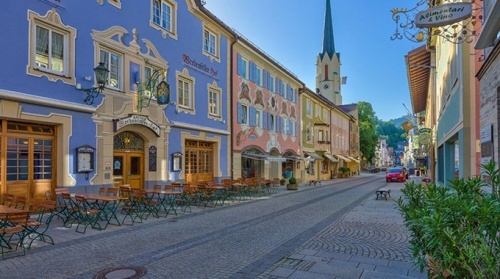 Partenkirchen has kept its authentic feel and cobbled streets while Garmisch tends to be a bit more modern. Both offer plenty of charm, with buildings painted with traditional frescoes, and shops ranging from bakeries to goldsmiths. There's a variety of hotels to choose from, most offering a good 4-star standard and they generally represent excellent value. There are plenty of alternative activities on offer: a trip to nearby Olympic ski jump, fly down a toboggan run, or even hike through the old Olympic bobsleigh track. A week's stay at the three-star Hotel Rheinischer Hof with Crystal Ski costs from £775 per person (two sharing) including half board, flights from Gatwick to Innsbruck departing 5 January 2019 and transfers.